You are here: Home / Product Reviews / Best Dog Carrier Backpack: What Would Be Best for Your Small Dog? Choosing the best dog carrier backpack can be tricky. If you’re always on the go and have a small dog, a good dog carrier backpack can make transporting your dog easier. Small puppies who wouldn’t normally be able to go on long hikes can hitch a ride using a dog carrier backpack. They’re also great for airports and other busy places where your dog might get overwhelmed or frightened. 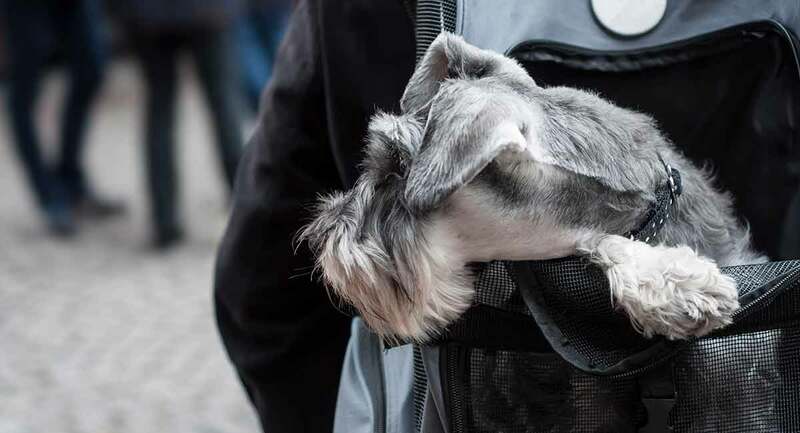 Having the extra layer of protection that the best dog carrier backpack provides can really help your pooch find a “safe space” in a crowd of people. But many of the best dog carrier backpacks have tons of different features and designs. It can be difficult to choose what pet carrier backpack is right for you. To help you make the right decision, we’ve gathered all the best dog carriers and backpacks into the right place. No matter what you’re looking for, you’ll find the perfect option in this article. The K9 Sport Sack AIR is designed for medium-size dogs, but it does come in multiple sizes. This carrier is one of the best dog carrier backpacks money can buy. This large dog backpack carrier is designed for safety and comfort. It is completely hands-free and easy to use. There are no complicated straps to mess with or measurements you need to take. It has two side panels that offer ventilation, making this carrier a good option for warmer climates. This pet carrier backpack also has more than five safety features, so you can rest assured that it is completely safe for your pooch to ride in. While this carrier is very useful for transporting your dog, we also recommend remembering that exercise is important for your pet to maintain a healthy weight. Forty percent of companion animals are obese, so it is important to ensure that your pet gets enough exercise even if you use a carrier. If you’re looking for the best dog backpack carrier for hiking, you can’t beat the Pawfect Pets Soft-Sided Pet Carrier. This carrier features secure claw-proof mesh and zipper buckles, making it nearly escape-proof no matter how inventive your pet may be. The inside has a leash tether that can be attached to your pet’s collar as well, keeping your dog inside even if the door is open. It really doesn’t get more secure than that, making this one of the best dog carrier backpacks. The carrier features breathable mesh and nearly two whole sides. This feature provides your pet with plenty of ventilation and a cool view of what’s going on outside. Due to the carrier’s unique design, it can be carried on your back or placed on the floor. This double-use means that you won’t even have to take your pet out when you get to your destination. For those particularly long hikes, the shoulder straps have extra thick padding, providing extra lumbar support. The backpack also folds for easy storage, so you can put it away when you aren’t using it. Intense exercise has been linked with a breakdown of the joints, so it is often in your pet’s best interest to be carried a bit during long hikes. The PetAmi Deluxe Pet Carrier Backpack is designed for your small dog to travel in comfort. It is well-ventilated for optimal airflow and features two-way entry to quick access. It works particularly well as a puppy carrier backpack. A zip-up mesh window provides your pet with more headroom and allows your dog to see what’s going on. The inside is lined with thick Sherpa for optimal comfort. The backpack is firmly structured to give your pet as much room as possible. This backpack is so comfortable that you’ll be wishing you could trade places with your pet. Luckily, the carrier is created to be comfortable for you as well. The back and shoulder straps feature extra thick padding for comfort while traveling. A waist and chest buckle provide extra support and make up for the bag’s firm design. This is particularly handy as a dog backpack carrier for biking. The comfort level also makes this a contestant for the best dog carrier backpack. Side pouches and a front pocket store essential pet supplies. There’s also a collapsible pet bowl to keep your small dog hydrated as you travel. If your dog is brachycephalic, this carrier can be useful in preventing overexertion. Because dogs with flattened faces have exercise intolerance, carrying them in this carrier can prevent them from exercising more than is healthy. Scratch “find good rucksack to carry dog” from your to-do list. The Naturvalla 6-in-1 Pet Carrier backpack fits the bill. This carrier is designed to be more spacious and provide more headroom than other carriers, so it can fit bigger pets. The frame is tough, firm and flexible. It ensures that your pet has plenty of room without causing you discomfort from wearing it. The high-quality fabric is water-resistant, and four mesh areas provide adequate ventilation. The entryways come with zipper security locks, so you don’t have to worry about your dog getting the bag open. There are also two pockets to help you stay organized and an inside leash for when you need extra security. If you’re looking for a dog carrier front backpack, the COODIA Legs Out Front Pet Dog Carrier (https://www.amazon.com/COODIA-Carrier-Backpack-Holder-Outdoor/dp/B076BC2TVF/ref=sr_1_3?ie=UTF8&qid=1549467072&sr=8-3&keywords=dog+rucksack+carrier) is the way to go. The hands-free design provides comfort for your pet and mobility for you. The straps come with added padding, so they rest comfortably on your shoulder and back. Two side zippers make it easy to get your dog in and out, but ensure that they can’t escape when you don’t want them to. The whole carrier weighs less than 9 ounces, so you don’t have to worry about lugging around a lot of extra weight. Backpack Dog Carrier 20 lbs. It can be difficult to find a carrier that is designed to carry your dog in a backpack, especially a dog more than 16 pounds. But luckily the PetBonus Denim Front Dog Carrier (https://www.amazon.com/PetBonus-Kangaroo-Shoulder-Adjustable-Backpack/dp/B01NATPG4K/ref=sr_1_3?ie=UTF8&qid=1549482726&sr=8-3&keywords=backpack+dog+carrier+20+pounds) can do just that. It is perfect for the outdoors and allows you to hike hands-free. It is super comfortable for both you and your dog, so you can use it for extended periods without worry. Plus, this carrier is also machine washable and straightforward to use. All you have to do is unzip the side zippers, slide your pup in and then zip it back. All straps are adjustable for a perfect fit. Customers love how perfectly this carrier fit. Many proclaimed that it fit better than any other brand they had tried. We’ve highlighted examples of the best dog carrier backpack in this article. From this list, you have a variety of styles and size options available. We recommend carefully reviewing your needs to select the best dog rucksack carrier to fit your needs.